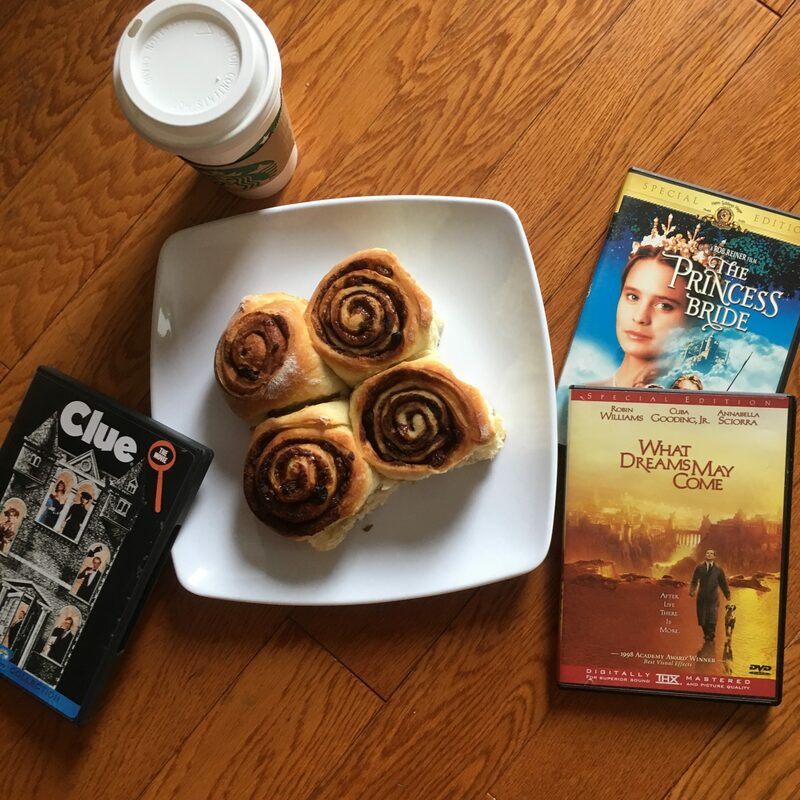 Sometimes it’s just a make cinnamon buns, coffee and movies kind of weekend. I have been craving cinnamon buns for weeks. I have no idea why. I just wanted a big sticky gooey, yummy, sweet cinnamon bun. But I also wanted to respect my needs (and not feel awful after) so I wanted it dairy free and naturally sweetened. 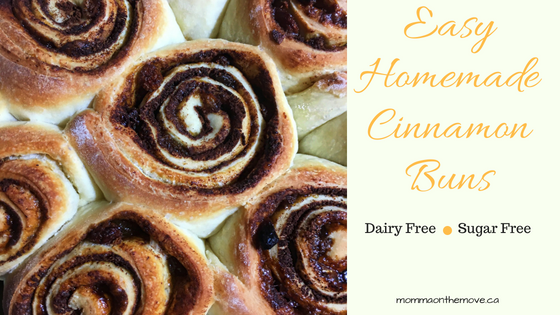 So I couldn’t just run out to the store and get one – I decided I was going to make some sugar free dairy free cinnamon buns. Of course my biggest issue was time. When I am baking and/ or creating in the kitchen I like to have the time to do it. I don’t like to feel rushed or hurried, or that I have to get to the next thing. I just want to move from one step to the next at whatever pace I choose. Often enjoying a favorite movie in the background as I work. I like to take my time, enjoy the experience and give myself space to do it. I also need to feel motivated or ‘in the mood’ as they say. I find if I don’t want to then I won’t enjoy doing it either and it certainly won’t turn out. 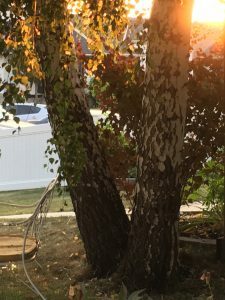 This weekend the stars aligned and I had all these things in place, time, desire, all the ingredients (as sometimes that is a big barrier to lol). It was the kind of weekend that was just for me, doing what I wanted to do when I wanted to do it. A soulful weekend I like to call it. A time where I can do things that I love and fill up my soul. Sure I had work to do, and other tasks that certainly could have used my attention, but sometimes we really need to take a break, get away from work and I needed this more. I needed to rejuvenate and reconnect with myself and well baking and creating in the kitchen is one way that I like to do it. Now you have to understand what kind of undertaking making cinnamon buns from scratch was for me. Growing up I had tried a number of different bread type recipes and could never get them to rise successfully. No matter what I tried or how I did it, I just had no success. You know when they say you should let it rise til it doubled in size? I was lucky if it rose even a little, if at all, and that was after hours of waiting. Failed after failed attempt, I watched others do it successfully, my aunt did it with ease, I think even my sister managed it once, but for me it just wasn’t happening. So to even attempt a cinnamon bun recipe where rising was involved was a big thing – I had absolutely no idea if they were even going to turn out as the light and fluffy cinnamon buns I desired, or if I would end up with rocks in the garbage once again. 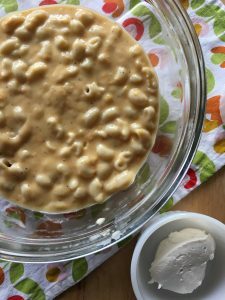 I was also playing with ingredients – creating a recipe that was naturally sweetened and dairy free, I put some things in and took some out. I laughed as I was telling my girlfriend about it when I went to yoga, leaving the buns behind hoping they would rise and double in size by the time I got back. Because of all the tweeks I had made I really thought it would be a miracle if they worked. To my delight, when I returned home from a lovely yoga and essential oils class, the cinnamon buns had in fact risen and doubled in size! I was so excited I took a picture and sent it to my girlfriend right away! (I have no idea if she was as excited as me to see this but I sent it anyways). I giddily turned on and preheated the oven, preparing them to bake. I couldn’t wait to pull them out of the oven and taste them! hoping that my cinnamon buns had not only risen but that they tasted good too. The good news is, they did. In fact, I have had a hard time not eating them all and am grudgingly sharing them with the kids. The beauty of it is the recipe is so easy the kids could make them themselves with a little supervision. And since they devoured theirs today afterschool they announced that they are very willing to do so! 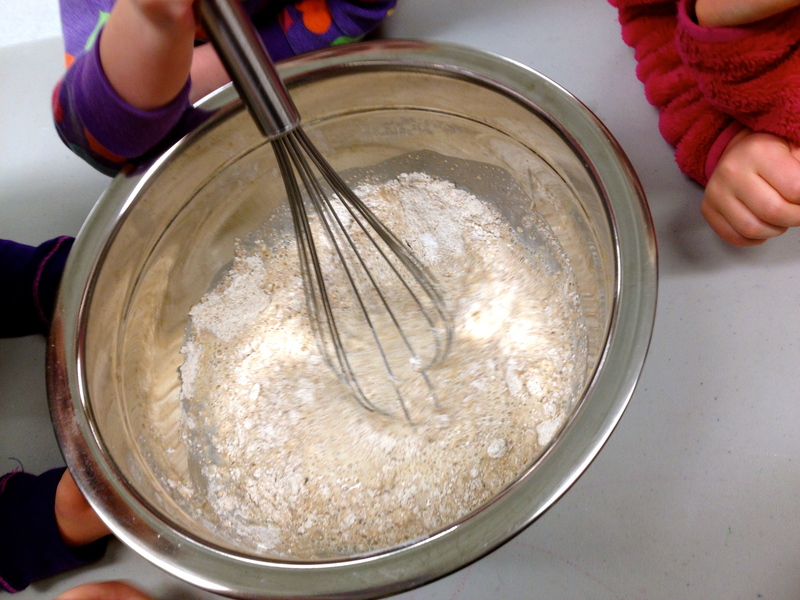 Mix 2 1/2 c. of flour, salt and yeast together. 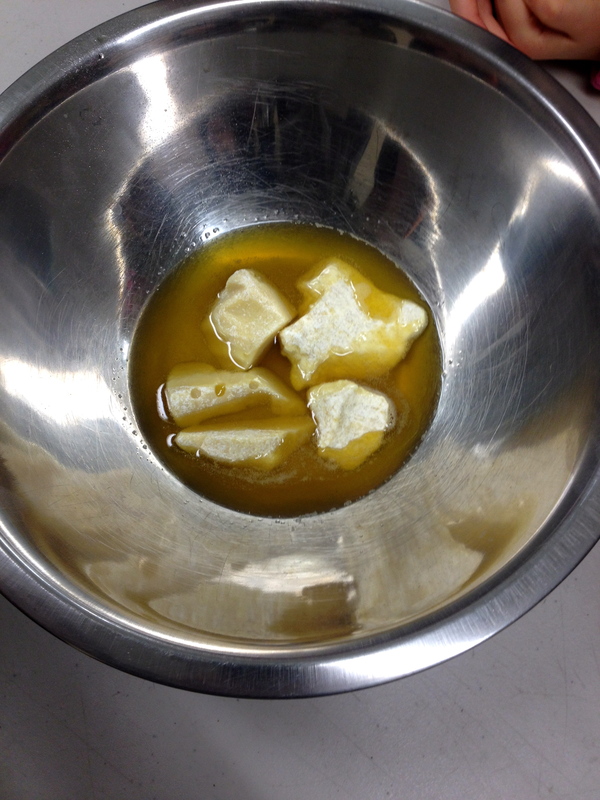 Create a hole in the middle of the dry mixture and add the honey to the hole, but do not mix. Set aside. 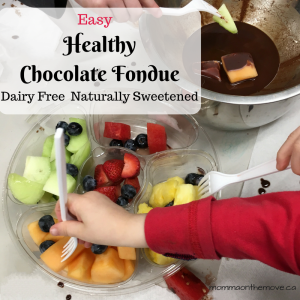 Heat the water, non-dairy milk, and Earth Balance on low heat on the stove. DO NOT bring the mixture to a boil, make sure everything has melted, mixed together and is hot but not boiling. If it boils the temperature of your mixture is too high and may not turn out. Add the liquid mixture to the dry ingredients by pouring liquid in the middle over the honey – this is so the honey will melt and dissolve into before mixing. Ensure that the honey has completely dissolved before beginning to mix. Using a dough hook on the stand mixer, mix together on a low setting. If all the dry ingredients are not mixing as well you may stop the mixer and mix in the rest by hand, then put it back under the mixture to complete. If needed, add the rest of the flour a tablespoon at a time to form a smooth dough (I found that I did not need the extra flour but you may depending on where you live). Continue to mix for 5 minutes. Allow the dough to rest for 3-5 minutes. 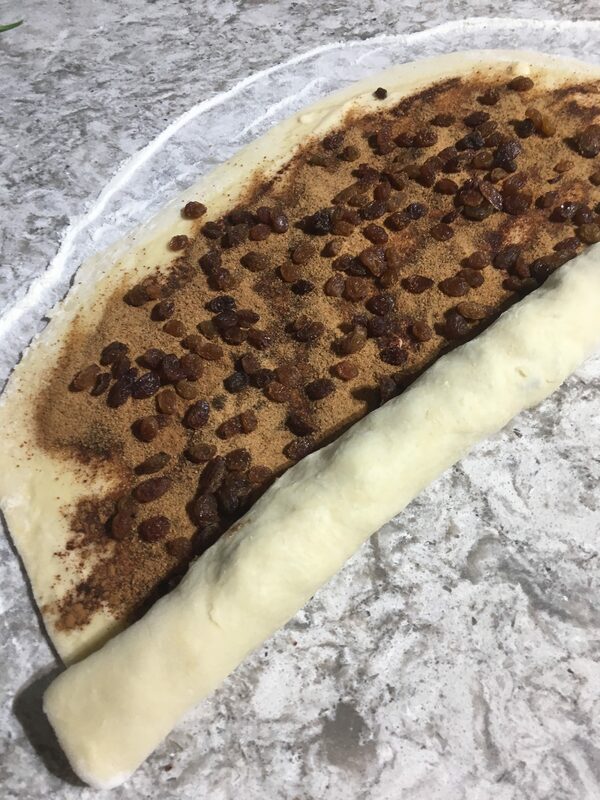 After you have allowed the dough to rest, use a rolling pin and roll out the dough into a rectangle shape about 1/8 inch thick. Spread the softened Earth Balance over the dough. 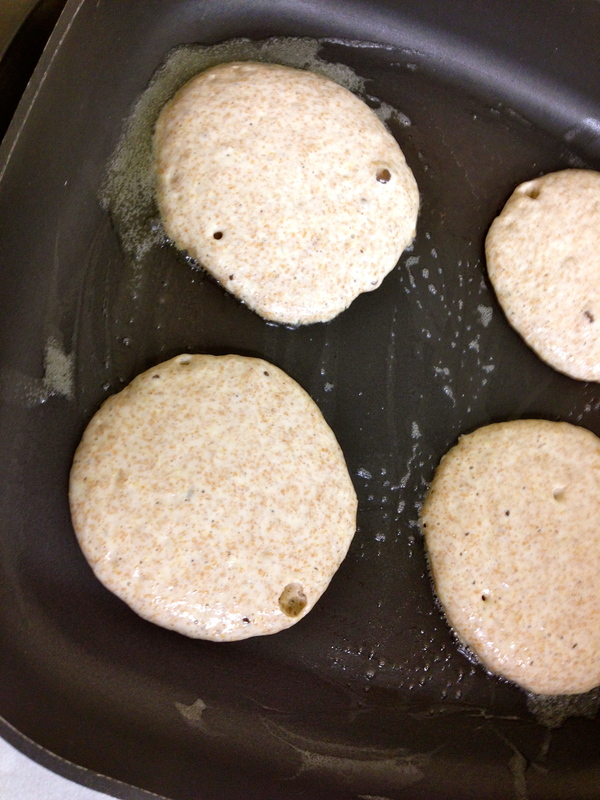 Then sprinkle evenly with desired amount of cinnamon and coconut sugar. Sprinkle with raisins. Beginning with the long end of the rectangle, tightly roll the dough so that you’re filing is on the inside. Cut the rolled dough into 10-12 even pieces. Place the pieces in a well greased 9×13 inch pan. Place the rolls in a warm draft free place and cover lightly with a clean t-towel. Let rise til they are double in size. Preheat oven to 350 F and bake for 25 minutes until golden brown. Remove from oven and cool. Now we found these sweet enough and enjoyed them without icing and honestly they really don’t need it. 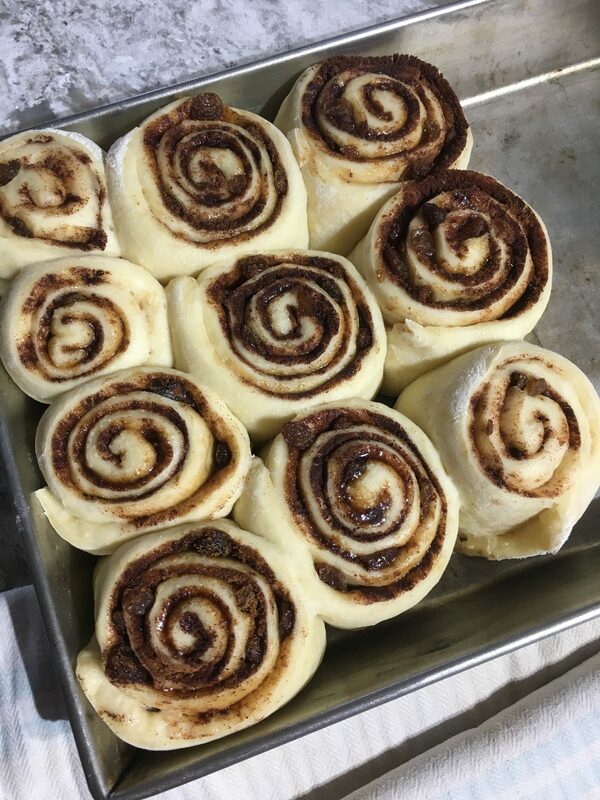 But if you would like to ice your cinnamon buns you can certainly do so. I have this yummy dairy free sugar free cream cheese icing that is to die for! So I am definitely going to try that on these cinnamon buns the next time we make them. If I can find it that is… I can’t remember where I put it… I’m sure it’s in that ‘safe’ place. (Once I do find it I will share it with you here). One of the reasons kids (and some adults too) steer away from green smoothies is because often times they are this ugly dark green and aren’t very tasty or sweet. And even though I like my vegetables, when my smoothie tastes bland and like just a glass of vegetables, that doesn’t appeal even to me – why would a kid like it? That being said I have found a green smoothie that I quite enjoy and has passed the ‘kid test’. It is actually the favorite of my youngest son. 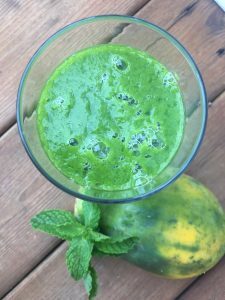 This green smoothie is sweet in taste due to the 3 kinds of tropical fruits, but not overly so, and a bright vibrant green. Stocked with 3 kinds of greens as well this makes for a very good combination. 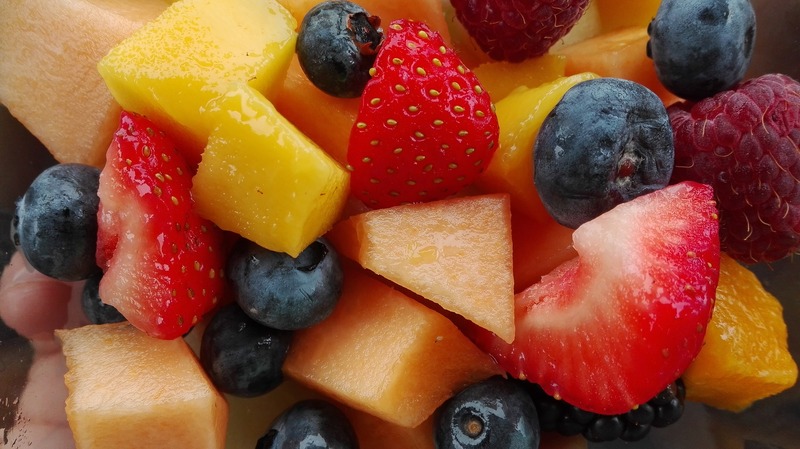 The nice thing is to if you need it a little sweeter you just add a little more fruit. I have even made this green smoothie in my kids cooking classes (ages 3-12) and most of them liked it. In fact, for some of them it was their favorite smoothie as well! Why do you want kids to have a green smoothie in the morning? They are an easy way to get in those greens everyday (and right at the start). I don’t know about you but sometimes I find this difficult and get to the end of the day with no greens whatsoever. I feel good when I start my day with some greens. Put all ingredients in Vitamix blender. Start on low moving up to high. Blend on high for 1 minute or until smooth. Enjoy! Give this green smoothie a try this weekend and see how the crew likes it. If it’s a success you can start incorporating it into your back to school smoothie rotation in the mornings and kick off the day with a nice green healthy breakfast. 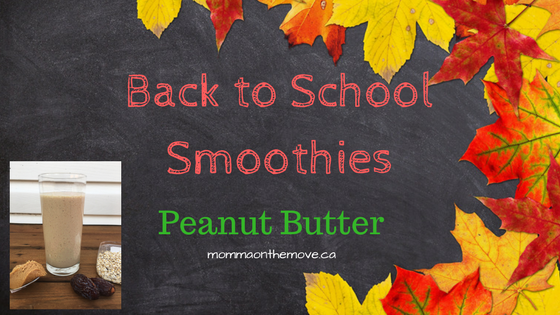 Peanut butter smoothies are a staple for my kids at our house. 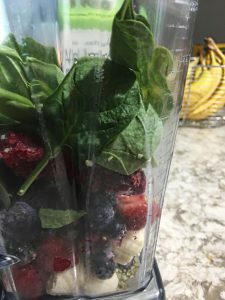 Even though I recommend changing things up and giving the kids variety, they go for days if not weeks in a row where they only want this smoothie. I really like the peanut butter smoothie because it is a super quick and easy recipe – with simply peanut butter, banana and milk. 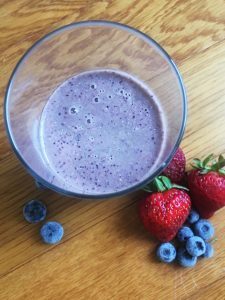 It is a nice thick creamy smoothie that is high in protein, filling and a great way to start the day! 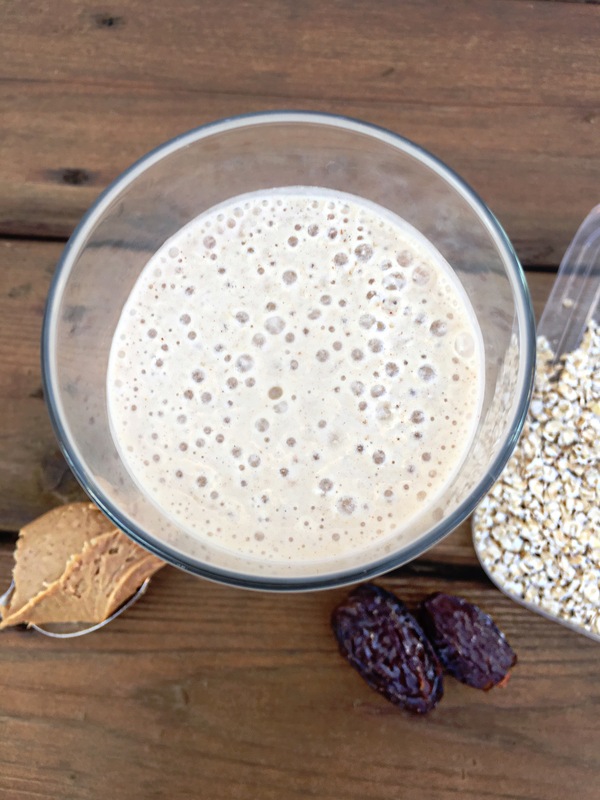 We tend to add in a few other ingredients to this smoothie like dates and oatmeal for a little added sweetness and nutrient boost. Dates are high in fiber and a good source of vitamins and minerals such as iron, magnesium, zinc and Vitamin A. They are also high in natural sugars which provide an immediate and sustainable burst of energy (sustainable because it also has the high fiber content). If you’re not a peanut butter fan or have an allergy, it is easy to substitute any nut butter in this smoothie or you can use Wow Butter, which is a soy based product (but does have added sugar) that has similar taste and texture to peanut butter. Put all ingredients into a blender and mix until smooth. Pour into glasses and serve immediately. 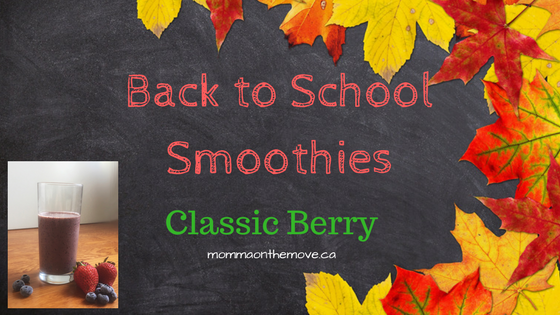 Mornings can often be a rush and a challenge to get everyone a good balanced breakfast and out the door on time, it’s one of the reasons I love Back to School smoothies. They are a quick, easy way to pack a bunch of important nutrients into one glass and start the day right. If you’re like me you have a love – hate relationship with this time of year. 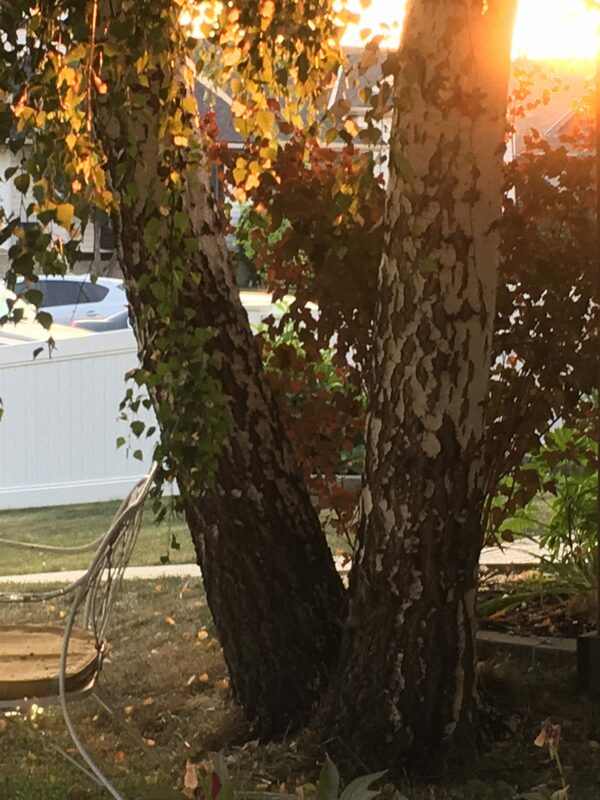 I love that the kids are occupied elsewhere during the day and I can focus on other things, the golden late summer sun and promise of fall in the air. I do not like having to make lunches or get up in the mornings and rush out the door, I prefer a slower pace and making lunch later. As a result I get up in the mornings with the shortest amount of time I possibly need to get us all fed and out the door (I can do it in about 30 minutes), which often means prepping things the night before and getting creative with breakfasts (this is also why I love overnight oats). You know what they say breakfast is the most important meal of the day! and I agree a good breakfast sets you up for a good, productive and successful day. This is why smoothies are a great solution. There are all kinds of varieties and combinations so everyone can have something they like; and I can easily make them night before (in it’s entirety or packing the blender and adding the liquid and blend in the morning). They are also portable, so if we’re running short on time we toss the smoothie into a to go glass and take it out the door and no one misses breakfast! It’s important to make a smoothie your child likes but it’s also important to keep in mind these few tips to make it a balanced, filling and energizing smoothie. Add in some protein – things like chia, hemp and flax seeds are all excellent sources of protein and when blended into the smoothie are not even noticeable. This also helps you feel fuller longer. 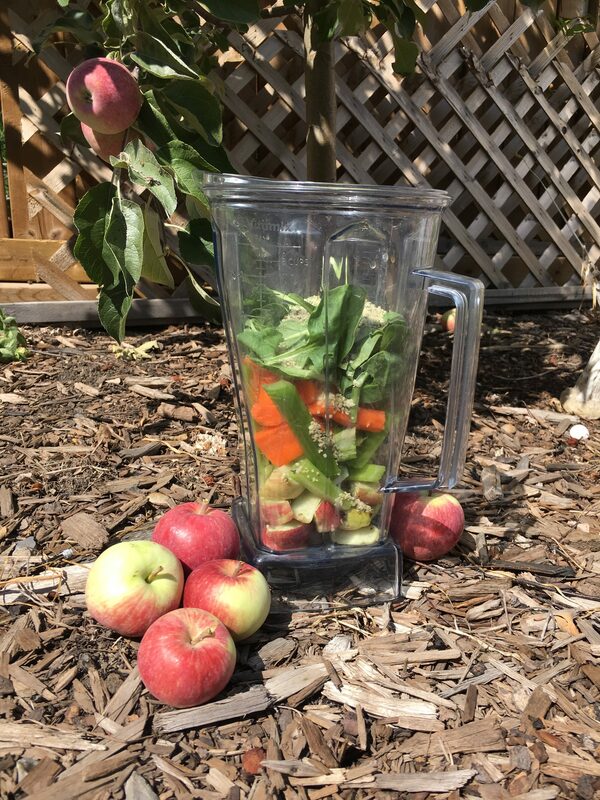 Add in some greens if you can – I know some kids watch what you do like hawks and if they see one green thing going in there they won’t drink it even if they can’t see or taste it! If you can, adding a handful of greens like spinach, will give them that extra boost for the day. Change it up – have a few smoothie recipes on the go for your back to school mornings. Variety is good and keeps kids interested. It’s also helpful as the seasons change and what’s available in season in the grocery stores. 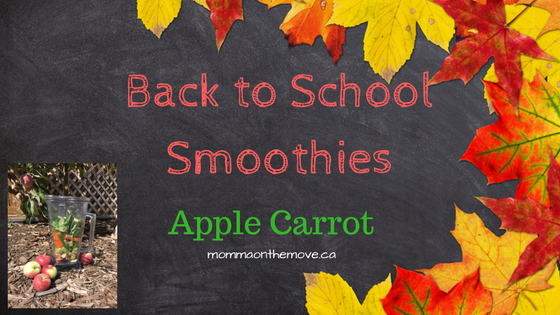 To get you going and inspired, we’re going to share some great Back to School smoothie recipes here on the blog over the next two weeks. 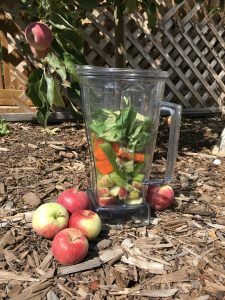 Today we’re starting with my Apple Carrot Smoothie, which is a beautiful use of many of the things that are currently being harvested (like the sweet delicious apples from our apple tree). Put all ingredients into you blender and mix thoroughly til smooth. And smoothies aren’t just for kids or breakfast! These are great for adults too and as snacks or a pick me up during the day. 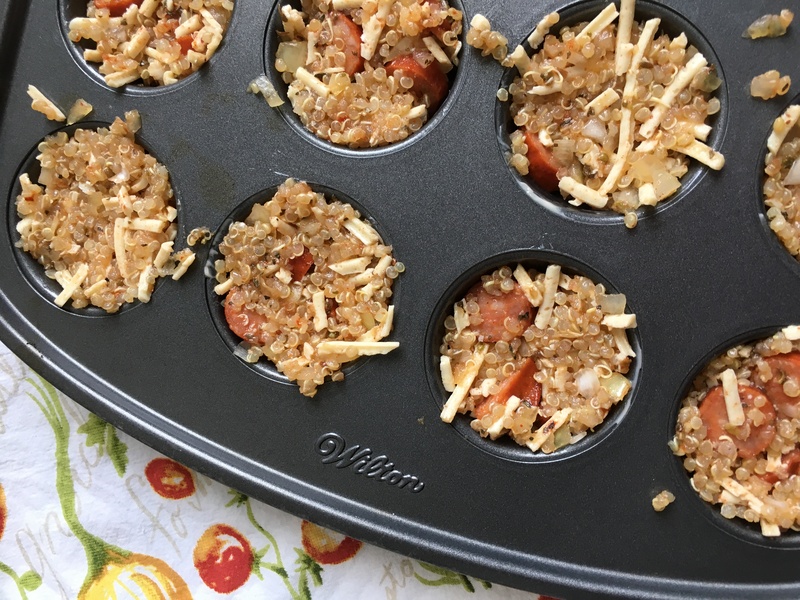 Definitely my favorite mini bite recipe so far are these Quinoa Pizza Mini Bites. At first when I looked at the recipe I thought having quinoa in it was weird and probably not very tasty, but it turned out to be delicious! The quinoa gives it a nice texture and does not make you feel that heaviness in your belly that pastry does. And it doesn’t take away or overtake the other flavors in the bite, it enhances and allows them to stand out. Quinoa, considered a plant food, is also super good for you. It is one of the most protein rich foods we can eat, as well as high in fiber, iron, magnesium and many other vitamins and minerals. It is also gluten free which is great for those who are looking for or in need of that option; and even contains antioxidants. On it’s own, quinoa is quite plain but is a fantastic healthy addition in salads, baked goods, warm breakfast cereals and more! 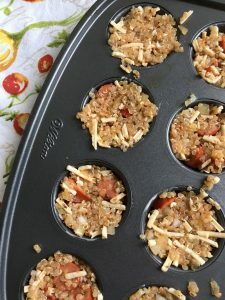 These pizza mini bites really do taste like pizza and with the quinoa in them they are super healthy. I was amazed at how good they were and how much they actually tasted like pizza. And like pizza you can add in your favorite pizza ingredients. I used small pieces of pepperoni but you could easily substitute ham, add peppers, chopped up mushrooms, etc. 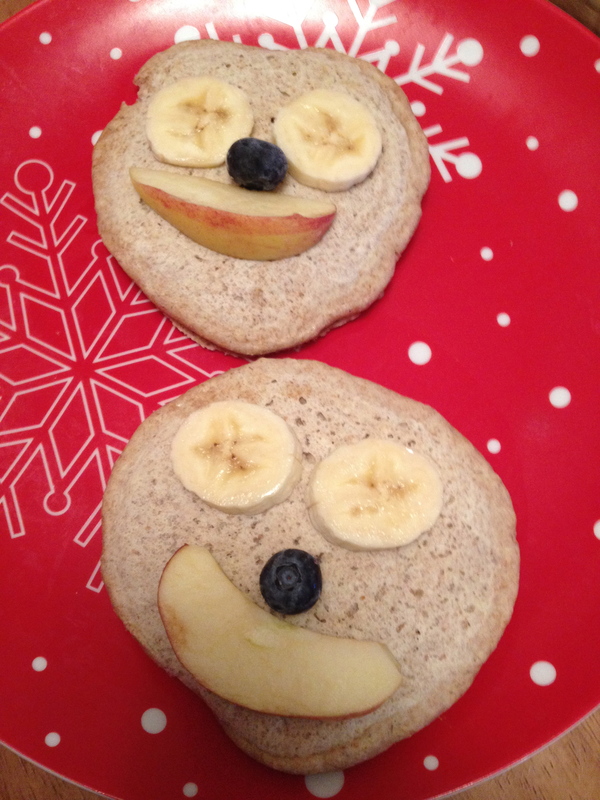 They are also fantastic for kids – they can easily help make them and they are a nice healthy option to put in their lunches or even for a snack. Yes you have to put in 3 or 4 but that’s ok this recipe makes a lot! They are even a great appetizer or snack for your next gathering or party. 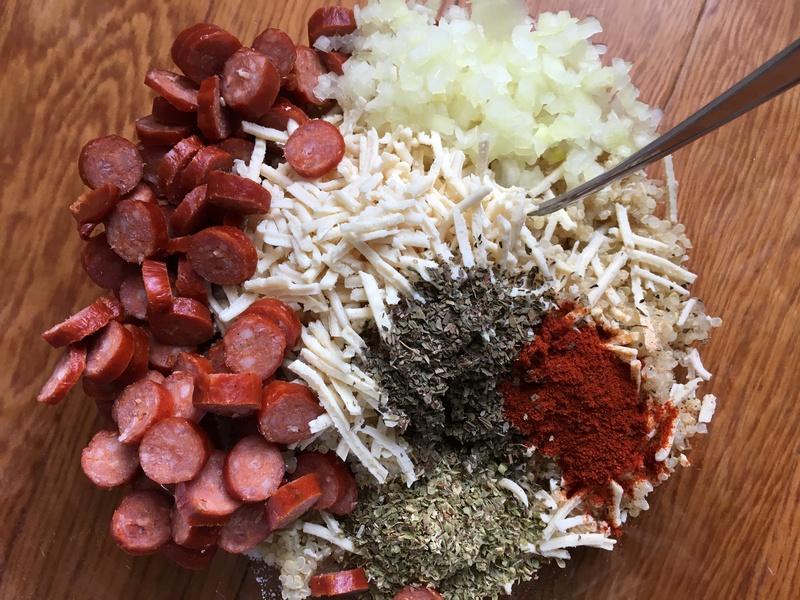 Mix together all ingredients, except pizza sauce, in a medium mixing bowl. Using a tablespoon, scoop the mixture into a well greased mini muffin tin, filling each cup to the top. Press down gently to compact. Bake at 350F for 15-20 minutes. Remove from oven and let cool slightly (about 5 minutes). Gently remove bites from muffin tin and serve immediately. These are also very good cold. So if you’re putting them into kids lunches or your own, there’s no need to heat them if not able to do so. Thoroughly rinse quinoa in a colander (make sure the holes are small enough that the quinoa does not go through). Once rinsed place in a small pot with water. Uncovered bring to a boil, then cover and lower heat to low. Cook for 15 minutes. Let quinoa cool slightly then fluff with a fork and either serve or use in desired recipe. I love mini bites! You know those cute little bite size foods that you pop into your mouth in one bite and are often bursting with flavor? How do they get all those ingredients into that tiny little compact dish anyway? I had often wondered why people would want to take the time to make these itsy bitsy bites, other than the fact that they are cute and look pretty (and may possibly even impress your guests when you’re hosting a party). Making them looked like a lot of work and that I thought I would need to eat at least 5 or 6 to feel full. Then I discovered how fun they were and came to the understanding that they are meant to be served as appetizers, which you are not supposed to fill up on anyway, and not full meals. They are also great for kids, especially ones who have smaller appetites as they can have one or two and feel full without having any waste – instead of having a bigger portion and not eating it all. 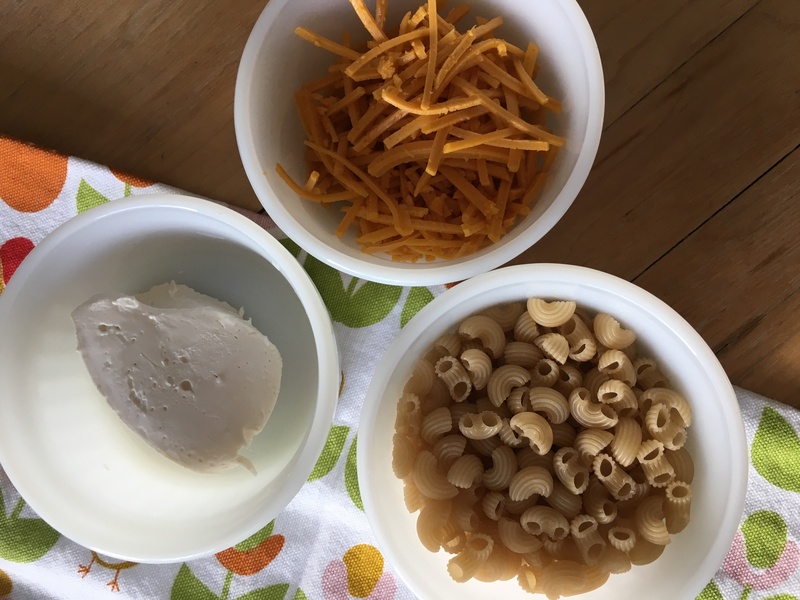 It is also a great way to introduce new foods to kids as you are giving it to them in a fun way and again with the smaller portion size, if they do not like it the waste is minimized. And there are so many different mini bite recipes to try you’ll never run out of ideas. You can come up with almost any combination and likely be successful. So I’ve been on the lookout this month for mini bite recipes to try. Looking for combinations that I knew would work and then considering how I might create one on my own. 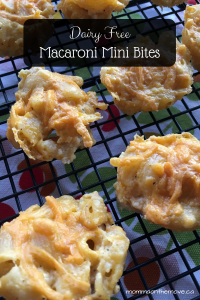 This week I started with macaroni bites, which are one of the more popular and common mini bite recipes out there, and usually a hit with kids. 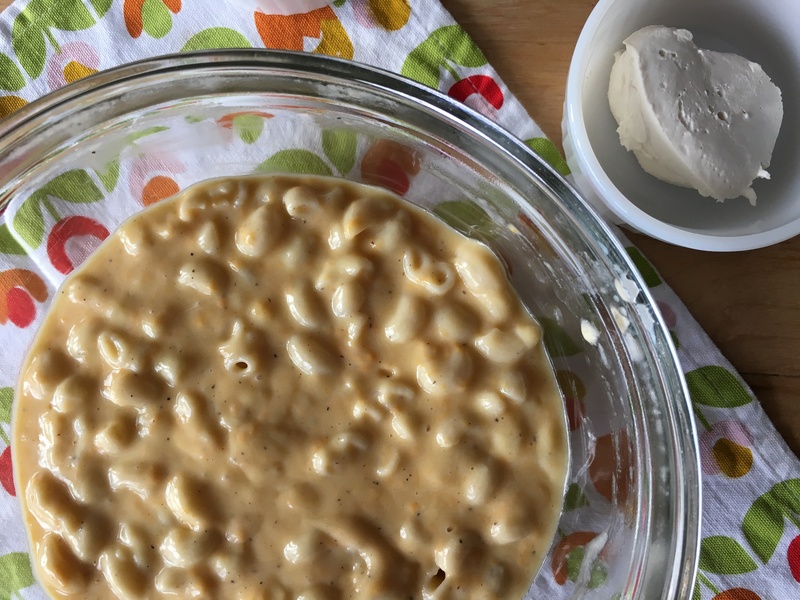 I loved this recipe as it has a super cheesy sauce and is simple to make. Also easy to make dairy free, these delicious bites will have you easily gobbling two or three! Grease well your mini muffin tin (like really well. This is the one downside of mini bites is those muffin tins, they stick and are hard to clean. Greasing it well does help but sometimes you have to scoop around them very carefully to get them out. If you can find mini cupcake liners you could use those and it would make getting them out and clean up a little easier. This may not work though if you want a certain look without the papers on them). Cook pasta according to package directions, rinse and set aside. In a medium size pan whisk the vegan spread and flour together until melted and smooth. Slowly add non dairy milk and bring to a simmer. Once simmering, add 1 1/2 c. of the cheese, vegan cream cheese, salt and pepper. Stir until smooth and creamy. Remove from heat. In a large mixing bowl carefully stir pasta, cheese sauce and well beaten egg until pasta is evenly coated and mixed in. 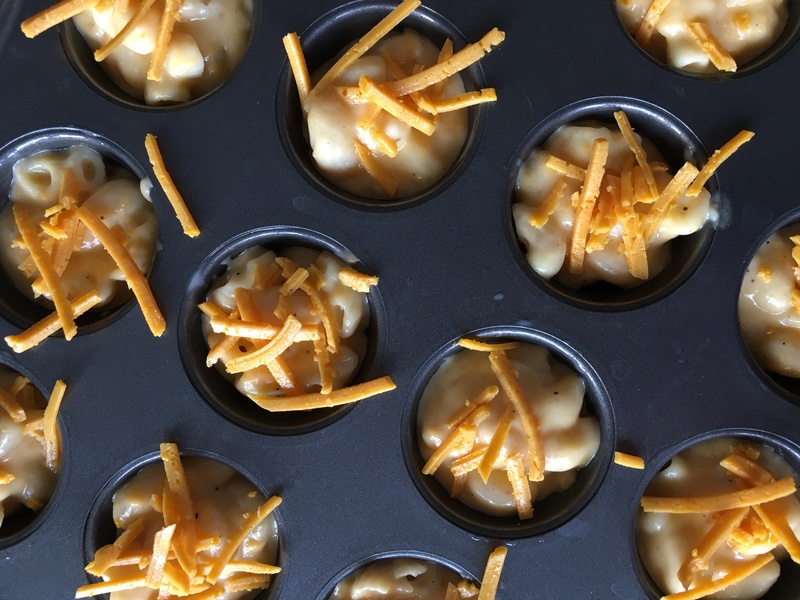 Using a teaspoon, spoon mac and cheese into prepared mini muffin tin, topping each with a small bit of cheese. Bake bites at 400F for 15 minutes or until golden brown. Remove from oven and allow to cool 5 minutes, then gently remove bites from tin. The first time I made these I made the original plain recipe but I felt that they were missing something. So I would highly recommend adding in real bacon bits, or a dash of cayenne or paprika to add a little zest. These are also a fun and easy recipe to make with kids. 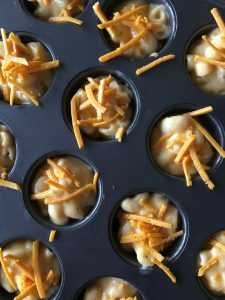 They can easily help with mixing it all together and scooping the pasta into the muffin tins. 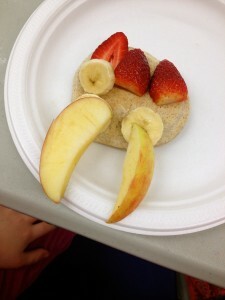 Kids love to help and research shows that if they help make it they are more apt to eat it! 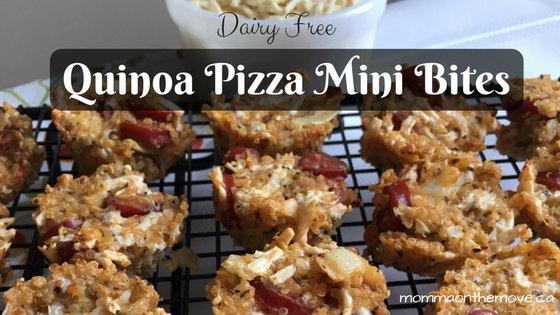 Don’t miss next week’s recipe Quinoa Pizza Mini Bites. What is your favorite mini bite recipe? Share in the comments below. Tacos are one of those great foods that are an quick easy dinner solution that you can easily incorporate many food groups (including vegetables) and taste delicious. They are also a fabulous way to get the kids involved in helping make dinner as there is lots of scooping and use of their hands. You may think it will create a big mess, but here are some easy ways how to make tacos with the kids and be successful! 1. Prep in advance – Chop, grate, cut the ingredients you are using in advance and put them into separate bowls that the kids can easily scoop or grab things out of. Place a spoon with each item so they don’t mix them. 2. 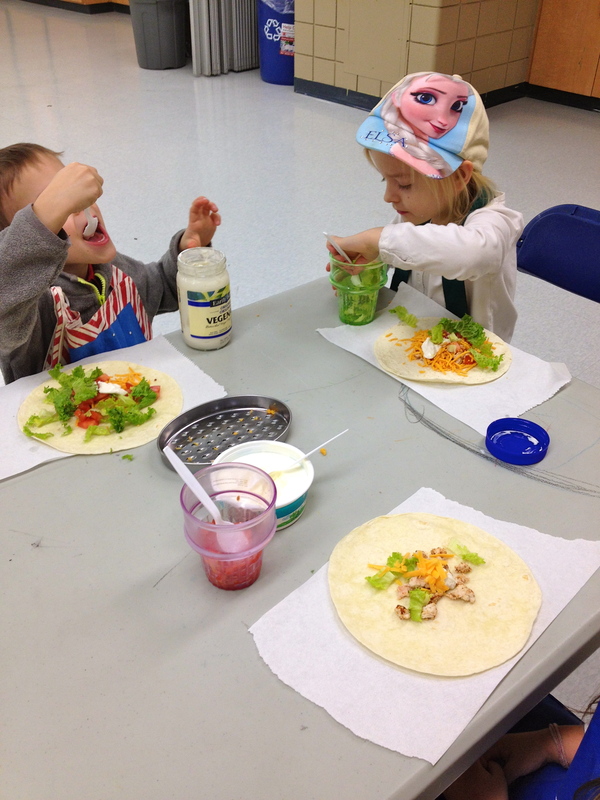 Provide a variety of ingredients – in Mini Chefs we used just lettuce and tomato and cheese, but you could include avocado, cucumber, spinach…basically any vegetable. 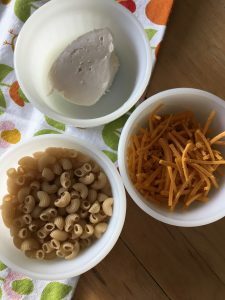 Providing variety will not only makes the kids curious but it will also encourage them to try a little, especially when they are making their own. 3. Use some kind of dip or spread – sour cream, Veganaise or mayonaise, guacamole, salsa all add a little flavor and variety to their taco. It also makes it less dry and provides nice texture and easier on the palate. 4. Demo what it looks like – make one and show them what you would typically put in it, everything from sour cream to tomatoes and cheese. Let them know that if they choose not to put an ingredient in that’s ok. The example will not only show them what can go in it but might encourage them to put some of those ingredients in themselves. 5. Let them make their own – give them the tortilla or taco shell and show them all the options, then let them decide which ingredients they want to put in and how much. (Remind them that they need to close up the tortilla so not to put too much in). When they make their own they are more likely to eat it. When I did this with my Mini Chefs class I had everything ready in advance and this made it very smooth when making them. The only thing we prepped together was to cook the ground chicken, which I did and they watched. They all really like watching what is happening as their curiosity makes them interested and that is the best way to get them engaged. Many of them tried different ingredients, creating their own with various amounts of the things they liked. We used soft tortillas, which I find easier with kids because you can roll them up and have less stuff falling out! 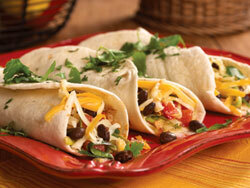 but you can use hard taco shells if you prefer. I did have to remind them that though they could put in what they liked, not to put too much in as we needed to roll it up and have it all fit. Rolling them up was the fun part. I showed them how to do it and then helped each child coaching them through rolling it up themselves, which each of them did quite successfully. 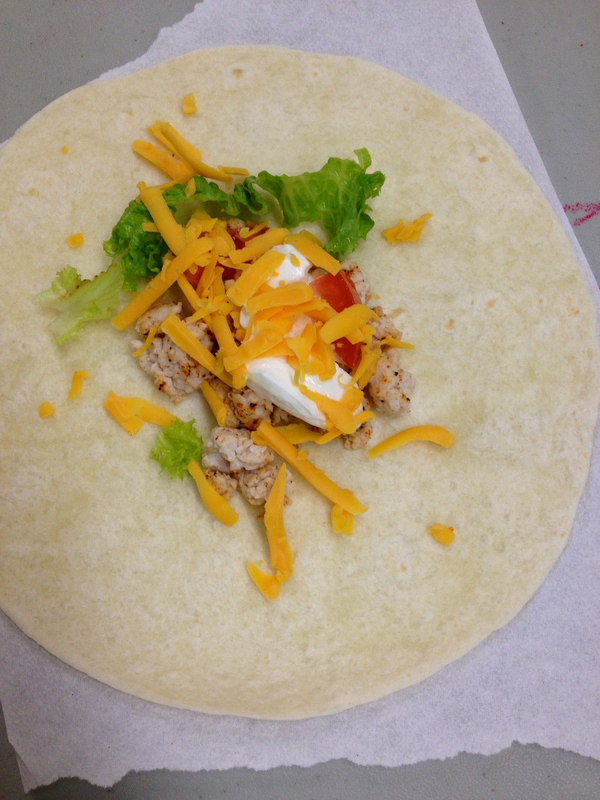 Once we had it rolled up then we chowed down and enjoyed our tasty creations. I even had the next week a Mom share with me that her son had made tacos for supper one night after this particular class, which I was so pleased to hear. She said he insisted on clearing up which he never does and he is now also eating lettuce, which he never ate lettuce. Wrapping it up and presenting it in a different way is one of the many reasons why this has occurred. Plus he (and the other children) were allowed choice in what they could put in and weren’t told that they had to use this ingredient or that one. 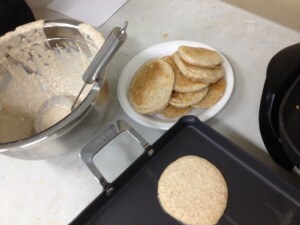 I feel that this class has been our most successful class so far and that learning how to make tacos has taken the children’s learning in the kitchen to the next level. It really is a simple nutrition packed meal which can easily be modified if you want it dairy free, vegetarian or packed with protein (add kidney beans or chick peas). 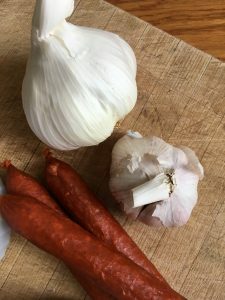 There are a large variety of different taco recipes and combinations to try, but I would recommend starting with a basic recipe to get the kids into it, and then expand upon it from there. Brown ground chicken in frying pan. Add 1 tbsp. 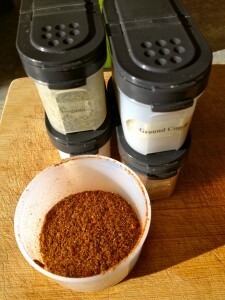 of taco spice and mix. Lay out one tortilla flat on counter or plate, spread a spoonful of sour cream on tortilla, add spoonful of chicken, tomato, lettuce and cheese. Fold tortilla over once, tuck in ends by folding over on each side, then roll the rest of the tortilla to end. Coming up next…some chocolate delights, macaroons and chocolate pudding!